With just 9 seconds left on the clock, Boulder High School Boys Soccer won it’s second league title in Boulder Soccer’s 32 years in the last game of the Front Range League season versus Mountain Range High School. The Front Range League is consistently the hard league title to win in Colorado 5A soccer. Boulder High won the league title in 2010 with goalkeeper Henry Huettel being the only remaining player from that team. Henry was a freshman back up goalkeeper in 2010. In 2011 Boulder High finished in 2nd place by just one point. Boulder High positioned itself to be in control of being crown 2012 Front Range League Champions by rattling of 5 wins in a row, including victories versus 5A Top 10 ranked teams: Fairview, Fossil Ridge and Loveland. However, a slip up against Poudre High put extra pressure on the Panthers to win the last two games of the season or risk being passed over by the other top teams in the league. On senior night, Boulder High beat a motivated Legacy High 2-1 and then had to turn around and play Mountain Range High away on the next day. With the potential for tired legs the Panthers persevered until the end. With just 9 seconds left on the clock, junior Pancho Valdivieso make a great defensive play and crossed the ball with technical perfection to the center of the penalty box. Senior goal scoring leader, Lake Brant scored the game winning goal and ignited the end of the game celebration. 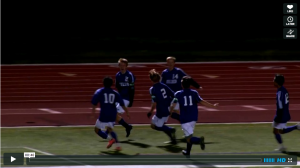 Click below to see one of the finest goals ever scored at by the Panthers. (A little unknown fact is that Pancho took a hard fall in the locker room before the game and was questionable to play but, with the league title on the line, the Ecuadorian exchange student was determined to compete for his team). The key to this teams success has been a unshakable team chemistry built on hours of training together, weekly team dinners, community support and a motivation to uphold the tradition of excellence at Boulder High. The next challenge for the team is the 5A State Playoffs.